Some shared traits of Canada’s milkweeds, however, are a large round or flat cluster of late spring or summer-blooming flowers. Their petals fold backwards on the stem and the centre of the flower is comprised of five hood-like structures within which is a protruding ‘horn’ as well as the plant’s nectar. Their leaves and stems typically have a milky sap, hence their name, Milkweed. 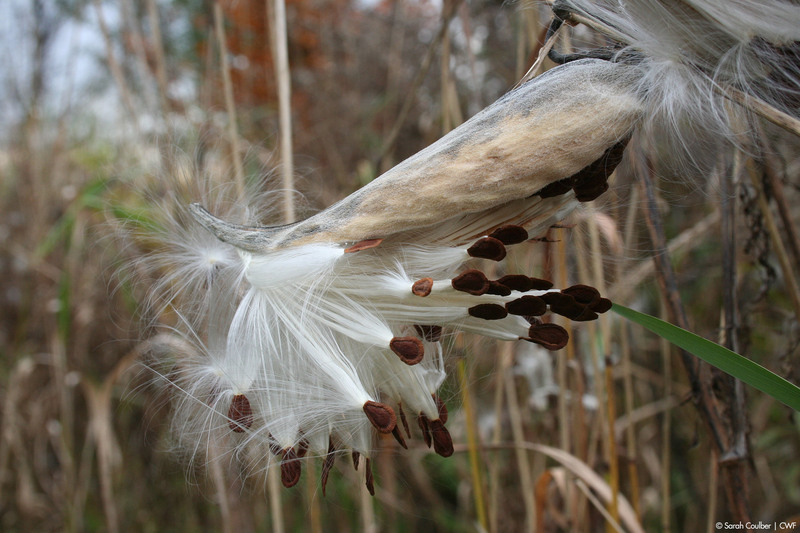 Ripe milkweed seed pods are elongated and, once hardened, open with a slit along one side to reveal many brown seeds attached to thin silky white fibres that fluff up to catch the wind and carry their seeds farther afield. 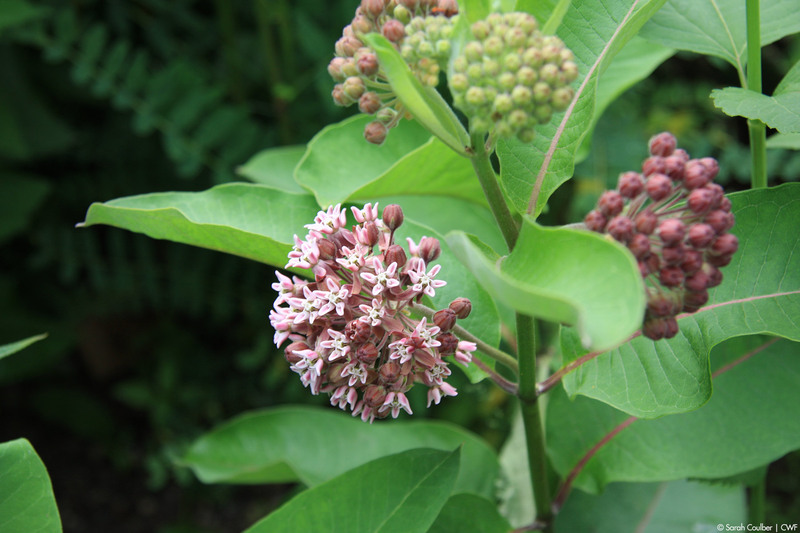 Range: Milkweeds are found in all provinces across Canada although they are not commonly found in Newfoundland and Labrador. They are not native to the northern regions including the territories. 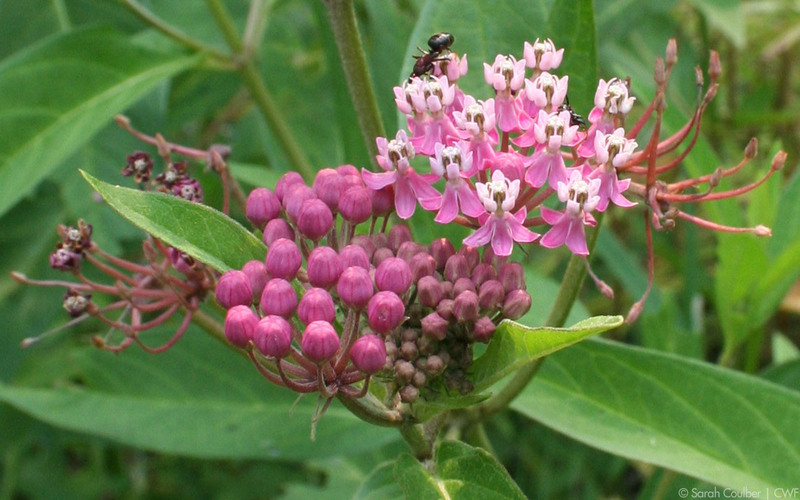 Habitat: Milkweeds grow in a variety of habitats from fields and forests to wet shorelines. See the list below of Canadian species and their preferred habitats. Milkweed flowers are extremely complex. The male and female parts are within the centre of the flower. This is different to a typical flower where the orange-yellow pollen grains are loosely attached to exposed anthers. Milkweed pollen is accessed only when an insect goes to drink nectar and their leg slips in through one of the narrow gaps between the hoods. In removing their leg they pull out a long pollen-bearing pouch that attaches itself and stays attached to the insect until it is inadvertently inserted inside a slit of a different flower. Only larger insects are able to complete the task, however, as smaller insects are not always able to pull free and usually die. Milkweed sap, contains cardiac glycoside to varying degrees, a toxin which repels many animals from eating it. Others, like Monarch Butterflies, are able to incorporate the toxin so that they themselves become unpalatable to potential predators. Milkweed is the food source for Monarch Butterfly caterpillars who are able to ingest the bitter and poisonous compounds in milkweed sap. The caterpillars carry the toxins into adulthood where potential predators soon learn to avoid the bitterness of this orange and black butterfly. 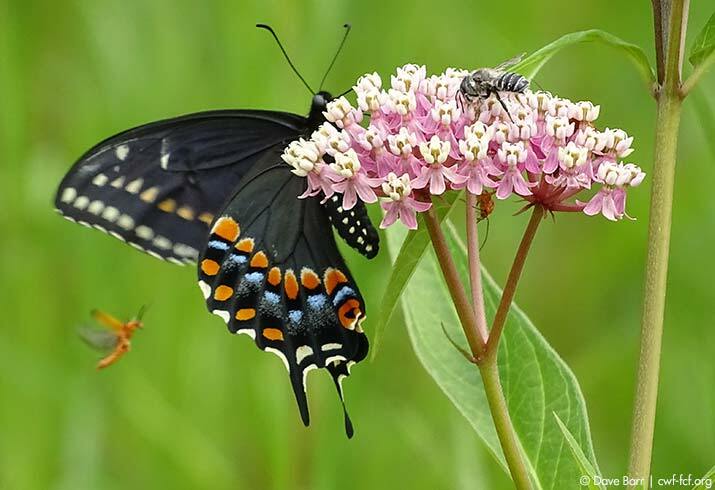 A few other insects feed on milkweed leaves and rhizomes while many more drink nectar from the flowers. Birds such as Northern Orioles even use the strong plant fibres from last year’s milkweed stems to construct their nests while others take advantage of leftover silky seed tufts to line their nests. Milkweed has helped people for centuries…and still does to this day! The hollow silky tufts that carry the seeds on the wind “is six times more buoyant than cork and five times as warm as wool”, according to William Cullina, author of Growing and Propagating Wildflowers of the United States and Canada. This buoyancy led to its use in the Second World War when the Allies’ supply of stuffing for lifejackets was cut off and schoolchildren were recruited to gather milkweed silk to use as a replacement. As for its insulation qualities, a Canadian company is currently producing winter coats with these milkweed fibres for warmth and the automotive industry is finding potential in milkweed for sound reduction for both cars and ambulances. In this regard, the fluff is especially appealing as it is lightweight and would therefore require less fuel to drive than other, heavier, materials. Milkweed silk is also being recognized for its ability to absorb oil but not water, making it an efficient and natural way to respond to oil spills. As a result of this increasing interest in milkweed down, many Quebec farms are now growing milkweed crops. Milkweed stems, with their strong fibres, have been used by Aboriginal peoples to make ropes and bowstrings while empty pods are used by modern day parents, educators for crafts and both stem and pod are employed in flower arrangements. Milkweeds have also been used medicinally for centuries in treating infections, warts and other ailments. This could be why they were given the name Asclepias in honour of the Greek god of medicine Asklepios (Asclepius). The milky sap which contains latex can be irritating to the skin although has been used as rubber. Various parts of milkweed have been used for food, although is toxic if not correctly prepared. If you want to grow milkweed but are concerned that the species you choose will spread, first remember that not all spread quickly. If you do plant one of the faster spreading species such as Common Milkweed or Showy Milkweed which spread mainly by their rhizomes, you can bury a wide barrier such as plastic garden edging that is at least 15 centimetres wide around the plant. For species whose roots don’t spread as quickly, you will be able to pull up new plants that pop up beyond your original clump. For keeping milkweed seeds from spreading, especially with species that contain seeds that germinate fairly well, you can snip the flower heads once they are all droopy after a period of being full and upright, a sign that they have been pollinated and are now preparing to make seeds. Common Milkweed and Showy Milkweed are the milkweed species of concern in this province but have a Tier 3 designation which is a low level of concern. If you are growing these plants in a garden environment where they are controlled then there should not be a problem. If, however, you grow them on properties where they could spread and potentially pose a threat to the economy, environment or human health then the Ministry of Agriculture may be called in to destroy them. 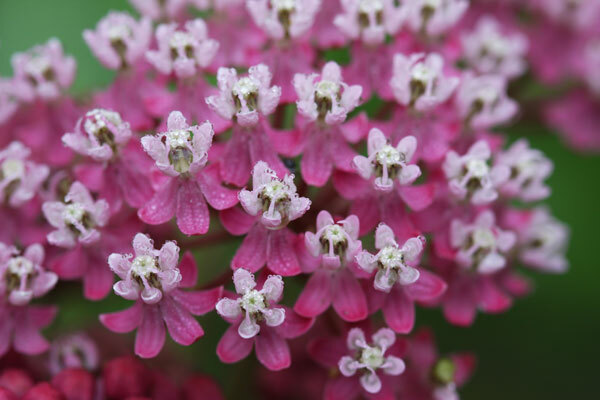 Common Milkweed is listed as a Class Number One noxious weed in Nova Scotia and is therefore not to be planted and should be destroyed to prevent spreading. Here are the 14 species of milkweed in Canada. One species, Asclepias variegata, is now presumed to be Extirpated (no longer growing there) from its native range in Ontario.